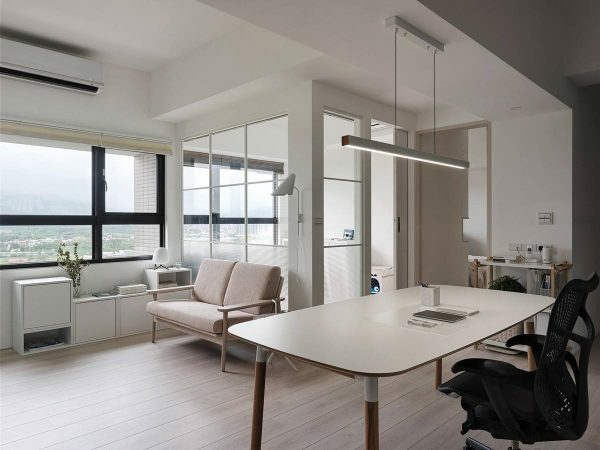 This office-like home interior, by The November Design is a vision of pure white: White painted walls and ceilings, crisp white veneer and powder coated metal, white kitchen and lights. Each icy detail just showing subtle variation in tone. 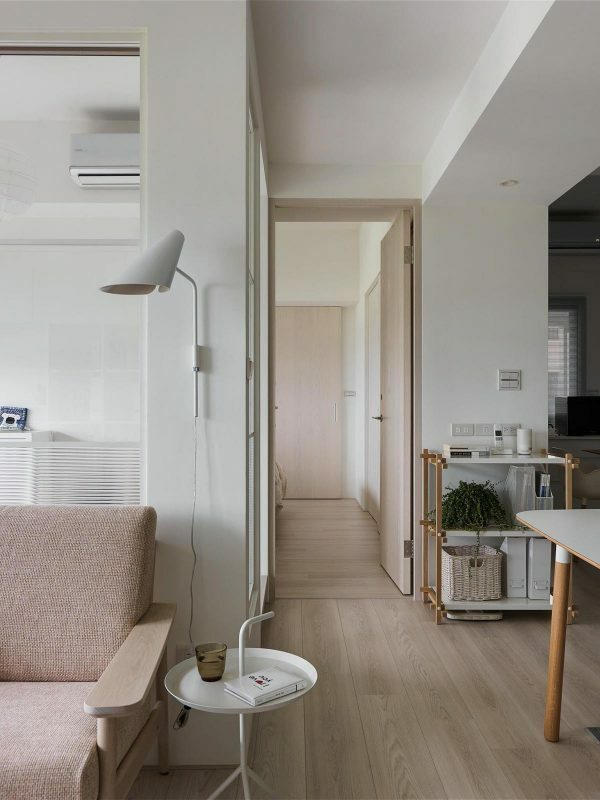 Elements of furniture and flooring provide accents of lightly warming woodgrain. Soft furnishings and the bathroom tiling bring hints of beige into the mix too. 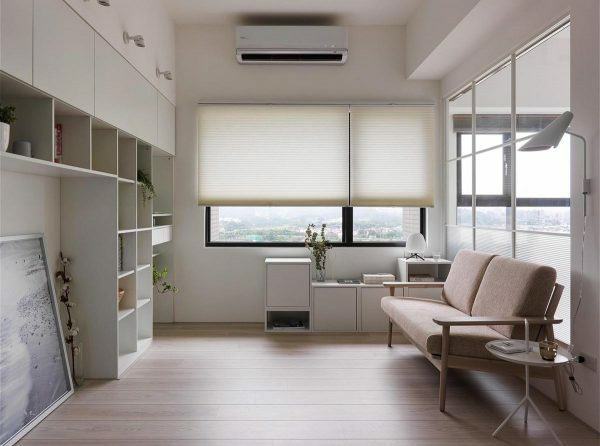 Because the palette throughout the apartment is kept so simple, all visual interest must come in the form of great design and layout. 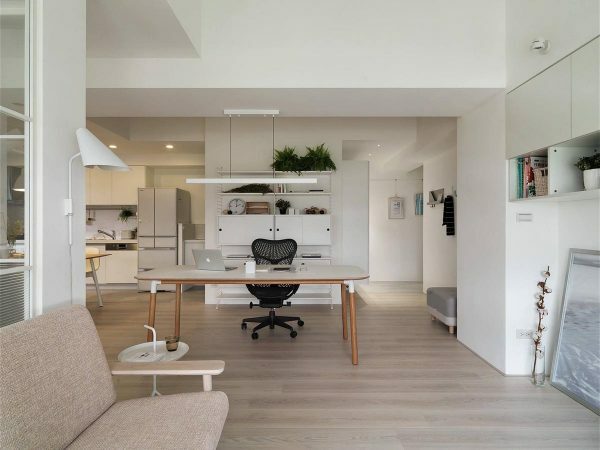 Dominating the layout is a large work desk, placed right in the centre, where a bold black desk chair waits. 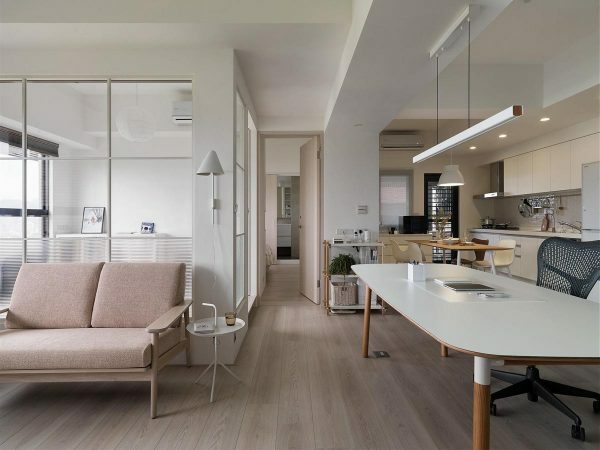 The sitting room of this apartment looks very similar to a client waiting area in an office or design studio. 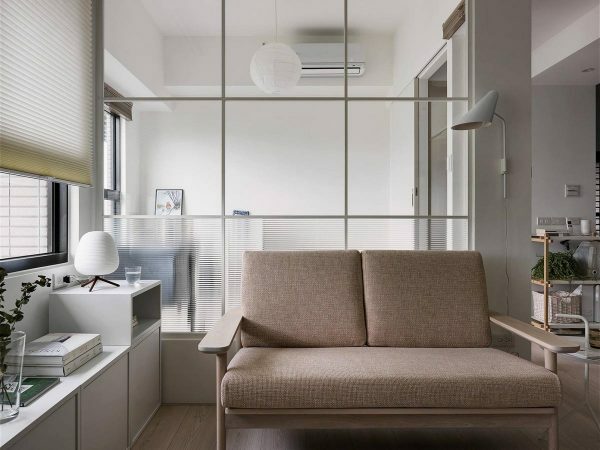 The neat wooden arm settee does not provide a lot of lounging space or cosy comfort, which might tell us a lot about the hardworking nature of this homeowner. 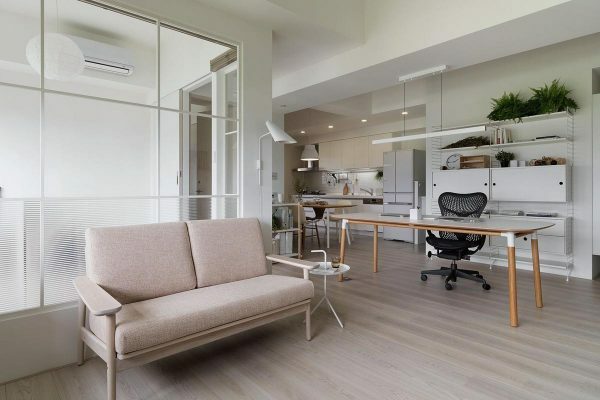 The surrounding storage furniture is also of a chic modern office style, typically found to be holding reference books, files and stationery supplies. A white wall sconce acts as a reading light over the seating area. A second lamp at the other end illuminates the book cabinets. 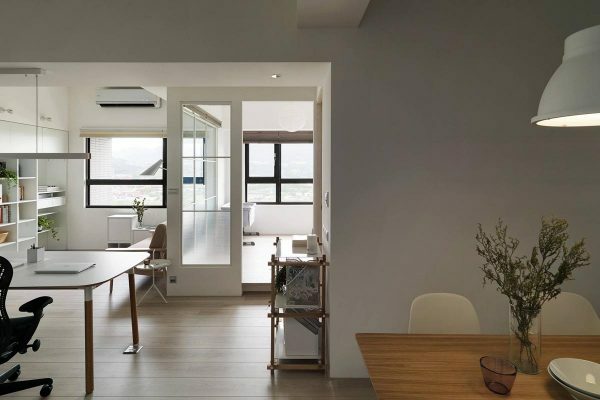 Although the colour-free decor might initially cause the home to appear minimal, the apartment actually contains a fair amount of furniture and storage. If each piece were to have been selected in a colour then this would be a busier scene. Directly adjacent to the small sofa we find the huge desk. The desk has been given much more floor space and status than the lounge area, suggesting work is of much more importance here than play or relaxation. Beneath the swing arm wall lamp, a handy end table makes an ideal spot to keep a current book. 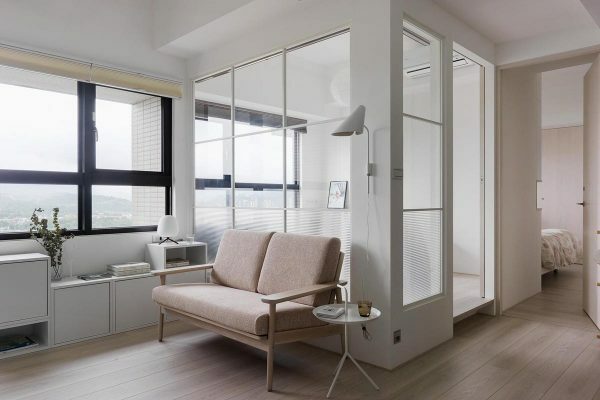 A glazed dividing wall lets extra natural light filter into the space. 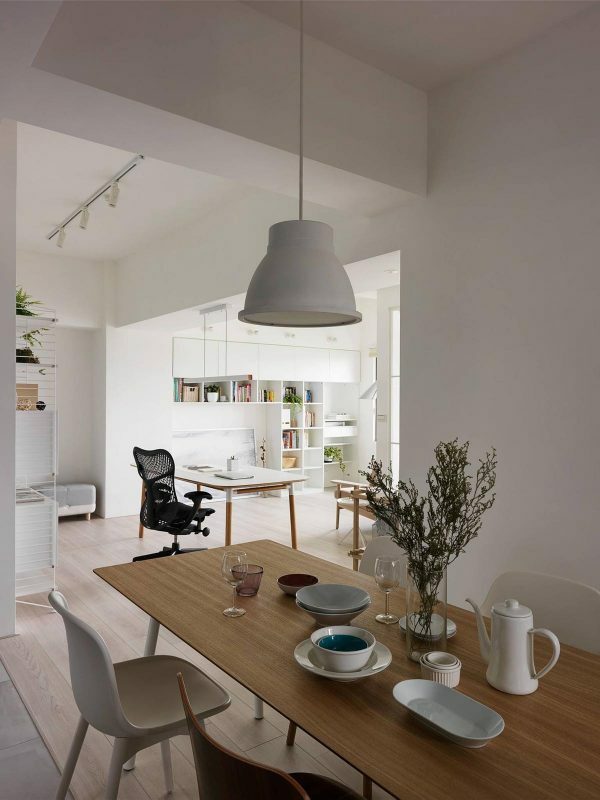 A white powder coated strip light is suspended low from the ceiling over the dominating desk. Stylish ergonomic chairs are essential to a highly productive work space, and this bold black version of the Herman Miller Mirra 2 looks like it has been given pride of place in its stark surroundings. 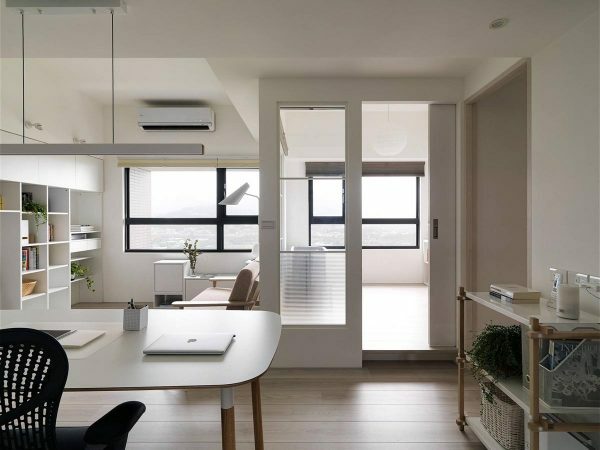 The desk is of a Scandinavian style and has rounded edges so that there are no sharp corners to cause painful bumps from its central location. Behind the desk, a modular storage unit is another place to conceal paper clutter. 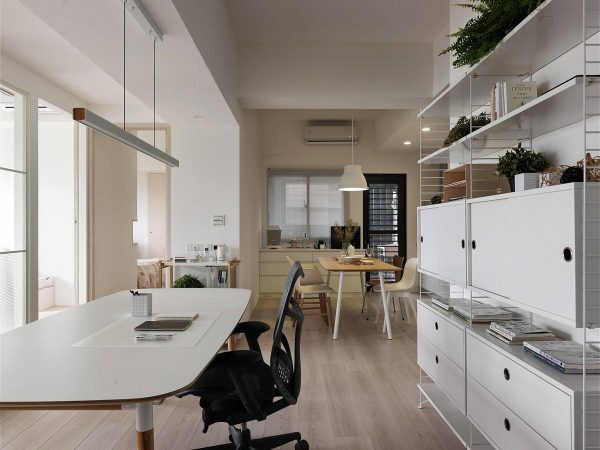 Matching the dimensions of the singular work desk, a dining table over in the kitchen area comfortably seats four. A sizeable piece of artwork is propped casually on the floor, also painted in pale tones to match the decor. Black window frames are the only other dark element in the scheme to match the black desk chair. The dining table centrepiece is a clear decorative vase, filled with a handful of simple greenery. The positioning of white and wood finishes on the desk top and legs has been flipped around on the dining table. Four different chair designs have been grouped together with the dining table to create a relaxed eclectic look. « How beautiful the world is in winter!